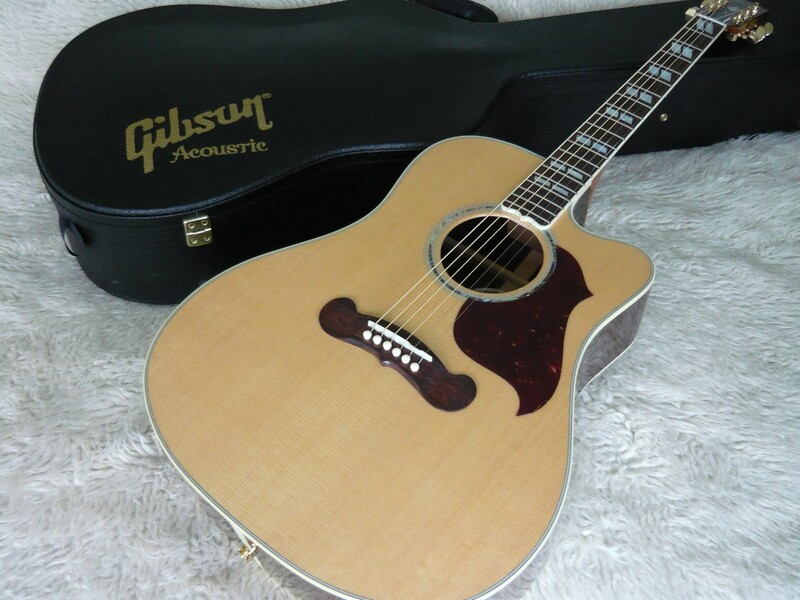 2016 GIBSON Songwriter Deluxe Studio EC - Natural. Brand new, 100% mint, not been a demo in a store.RRP $5999 At the heart of Gibson's square-shoulder dreadnought line is the Songwriter EC. First introduced in 2003, the Songwriter combines Gibson's time-honored bracing patterns of the 1930s with our original dreadnought shape, providing a supreme tonal quality. Stage and studio ready with high performance electronics on board. A pre-amp Fishman Prefix Plus - T. It has volume control as well as bass, treble, brilliance control, and a wide-range semi-parametric EQ to isolate certain frequencies and boost or cut them. Also a feedback-fighting notch filter and phase switch. A chromatic tuner that can be used without plugging in the guitar and low battery indicator. New Improvements for 2016: - New 2016 engraved truss rod cover - Fingerboard edge is softened to comfortably fit the contour of the player's hand - Finer grit sandpaper and polishing compounds for high gloss finish - Utilizing state-of-the-art German engineered Plek technology to create the finest playing surface possible. Hand finished for the world's finest feel and playability - Smoother hand rubbed and oiled fingerboard and bridges: New penetrating and finishing oil lasts longer and maximizes wood's natural vibrancy. Finish Type: Nitrocellulose Lacquer Top Wood: Sitka Spruce Bracing: Traditional scalloped x-bracing Back & Sides Wood: Rosewood Neck Wood: Mahogany Neck Joint: Compound dovetail Neck Shape: Rounded Neck Dimensions: .820 1st - .890 9th Fingerboard: Rosewood Fingerboard Inlays: Mother-of-Pearl Scale Length: 25.5" Width at Nut: 1.725" Electronics: Fishman Prefix T Bridge Rosewood Tuners Gold Grover Roto Tuners Hardshell Case Check out Demo https://www.youtube.com/watch?